After a century of tyrannical leftists ranging from Lenin to Chavez, the idea of an Upper Left political movement may seem strange, wacky even. But it shouldn’t be. The idea is not new. It was once mainstream in the English-speaking world. Members of the Upper Left were once called Liberals. Adam Smith was a liberal. He advocated free markets and some assistance to the poor, such as government-provided education. Smith even advocated an income tax, albeit a flat one. (Given the highly regressive tax system of his day in Britain, this was a major move to the Left!) Notice the similarity of the words: liberty, liberal. Liberal once meant something akin to Libertarian today, albeit less radical. So how about a modern Liberal Party for the U.S.? Well, there might be some branding problems. The word “liberal” in the U.S. now means something similar to “social democrat” on the other side of the Atlantic. 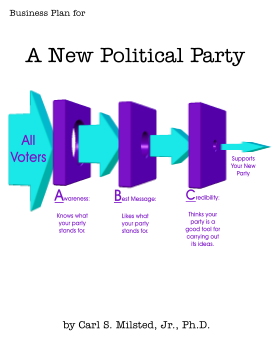 Long term, the confusion might be useful, much as what’s left of the American Independent Party cashes in on people trying to register themselves as independent of any political party. What we need is a modifier that conjures up more images of Adam Smith and less Lyndon Johnson. Classical liberal is the usual term. At least among the sophisticated, classical liberal does still connote freedom and free markets, albeit without the extremism of Murray Rothbard. Rush Limbaugh even had a guest host who called himself a classical liberal instead of a conservative. But classical liberal is a backward-pointing brand. This worries me. But unlike the Constitution as a core brand, classical liberal is a bit less tainted by slavery. Many classical liberals opposed slavery early on. It also points to an ideal that was never fully implemented. Avoid images of Thomas Jefferson and go heavy on the Adam Smith, and it might work. But I still prefer a forward-looking brand. Years back in my LP days, I helped my friend Kevin Rollins Rollins put together and distribute a libertarian outreach paper aimed at the downtown coffee shop crowd. The lefty coffee shops that were plentiful in Asheville were independent small businesses; these people were anti corporate, not anti business! As we brainstormed a name for the paper, we came up with The Free Liberal. The paper was well received by the target audience. Getting libertarian activists around the country to distribute the paper to their respective downtown coffee shops proved to be the bottleneck. The publication downsized to just a web site, and not even all that active any more. As a coherent brand, however, the idea could take off. The market is there. It’s a matter of finding activists enthusiastic to spread it. A Free Liberal Party could promote an updated version of classical liberalism. Yes, it could be a home for moderate libertarians, but it should also address some modern liberal concerns: the huge wealth gap, preservation of wild lands, toxins in the environment, racism, etc. Some of these concerns can be met with the classical liberal toolkit. If we balance the budget or even start paying down the national debt, it would put downward pressure on profit margins. The idea of a citizen’s dividend goes back to Thomas Paine. Using a carbon tax to fund Social Security Security is definitely in the spirit of Thomas Paine’s Agarian Justice. I own the .org version of the domain on the off chance I get the time to do something with it (and other people are seriously interested). However, I have growing reservations about the name. Personally, I am rather conservative in many regards. The active anti-Christian attitude prevalent among many liberals and cosmopolitan libertarians disturbs me. Legalize vice? Sure! Mandate acceptance? Hell no! And I won’t join a political party that puts a pro-choice-on-baby-murder plank in its platform. Any party with the word “liberal” in its name is likely to do so. So I prefer to investigate other options.